In Chinese folklore, Shui-mu Niang-niang, or the Old Mother of the Waters, is a legendary spirit guardian of the waters surrounding the city of Sizhou (or Ssu-Chou, according to ETC Werner’s romanization), in Anhui province of China. Depicted as a smiling old woman carrying two buckets of water, Shui-mu Niang-niang is popularly credited with the destruction of the Sizhou by flooding it every year until eventually bringing it into complete submersion by the waters of what is now called the Hongze Lake. The city of Sizhou was located in the intersection of three of the largest rivers in China - the Yangtze River, the Yellow River and the Huai River. According to historical records, Sizhou was buried after a massive flood in 1680 CE. According to legends, even before the devastating flood, Shui-mu Niang-niang had been causing floods in the city of Sizhou and its surrounding areas every year, resulting in damages and the loss of many lives. It is said that Yue Huang, the Lord of the Skies, received a report of this and sent his heavenly troops to capture her. But Shui-mu Niang-niang was clever, and always managed to avoid them. Her tricks triumphed, and the city continued to be devastated by floods year after year. One day, the heavenly troops saw Shui-mu Niang-niang near the city gate carrying two buckets of water. They were no ordinary buckets. Those two magical buckets contained the sources of the five great lakes - enough water to flood all of China. Li Lau-chuen, one of her pursuers, realized that with the two magical buckets at her disposal, openly attacking Shui-mu Niang-niang was too risky. Therefore, he brought a donkey and let it to the buckets to drink when Shui-mu Niang-niang was not looking. As the amount of water was too great for the donkey to drink it all, a little of the water was left at the bottom of the buckets. Shui-mu Niang-niang, upon realizing that this was yet another attempt to capture her, angrily knocked over one of the buckets with her foot, flooding the city of Sizhou with what is now become a part of the Hongze Lake. With that kick, Shui-mu Niang-niang had gone too far. 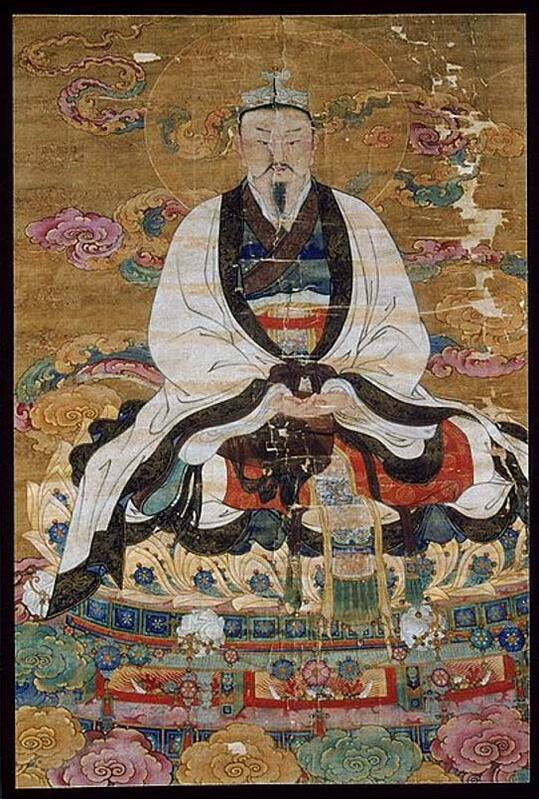 Yue Huang immediately sent reinforcements to his armies along with this message: Shui-mu Niang-niang was to be captured by any means necessary. Sun Hou-tzu, the powerful monkey god who could travel 36,000 miles in a single skip, started in pursuit and caught her, but the clever spirit slipped through his fingers. Sun Hou-tzu then asked the goddess Kuan-yin for help. Exhausted with fatigue and hunger after desperately running from her enemies, Shui-mu Niang-niang caught sight of a woman selling noodles. She went up to the noodle-seller and began to eat. She had only eaten half a bowl of the noodles when it changed in her stomach into iron chains, wounding around her intestines. The end of the chain protruded from her mouth, and the contents of the bowl became another long chain powerfully tying her body and stopping her from making any attempt to escape. The noodle-seller revealed herself to be none other than Kuan-yin in disguise. She had conceived this plan to punish Shui-mu Niang-niang who had killed a whole city. Kuan-yin ordered Sun Hou-tzu to take her down a deep well at the foot of a mountain in Hsue-i Hsien and chain her there. It is there that Shui-mu Niang-niang is said chained for all time. To this day, it is said that when the water is low in the well, one can see the chains that bind her. The story of Shui-mu Niang-niang is only one of the many stories attributed to the waters of China. It is an indication of these stories’ popularity that P'an Chi-hsun, an Imperial Commissioner for the Yellow River waterway between 1565 and 1592, recognized the need to address them. P’an Chi-hsun, who was considered one of the greatest hydraulic engineers in Chinese history, addressed the legends of the waters in China in his "Critical Discussion of River Schemes" where he says that although the rivers in China are credited with spirits, it is nothing but "the nature of water”. Indeed, there was a scientific reason for the submersion of Sizhou. Chinese historians cite the change of course of the Yellow River and its merger with Huai River as the reason. The Yellow River has been noted for its heavy annual sediment load and for the frequent change of its lower course over the last 5,000 years. The submersion of Sizhou, therefore, was not an instant phenomenon. The biggest man-made event which led to the submersion of Sizhou happened in 1128. In an attempt to block the northern nomadic cavalry from invading northern China, the dikes at Ligudu, Henan province were breached, and the river was diverted outward through Jiangsu province to the Yellow River. This changed the course of the Yellow River from going north to the Huai River, to the southern area, and continued flowing there for the next 726 years (1128 CE -1854 CE), flooding an extensive area of Anhui and Jiangsu provinces, thus creating Hongze Lake as we know it today. As a result, the city of Sizhou was completely submerged. The ruins of Sizhou have been found in the present Hongze Lake. Now nicknamed “the oriental Pompeii”, the lost city of Sizhou covered more than 2,000 square meters. Its inner city wall extends to almost 340 meters, and the outer city wall is roughly 130 meters in length. Experts suggest that Sizhou is perhaps better preserved than the city of Pompeii. The devastating flood that buried Sizhou is well documented in Chinese records and has been staged as an act in the Beijing Opera which attributed the drowning of the city to Shui-nu Niang-niang. Teresa Bane, Encyclopedia of Demons in World Religions and Cultures , [Online] Available here. Werner E.T.C., Myths and Legends of China, [Online] Available here.